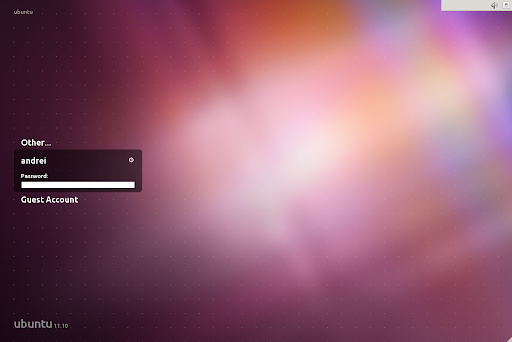 As you probably know, LightDM has replaced GDM in Ubuntu 11.10 Oneiric Ocelot. A "LightDM Greeter" is a login screen theme. The theme is nowhere near finished (it looks more like a draft) but it looks pretty interesting: there's a panel on top which seems inspired by the initial Wingpanel and comes with an animated user list as you can see in THIS .gif I've recorded. There are no official Ubuntu LightDM greeter mockups so it's still unsure how the final theme will/should look like. For instance, the user list on the left seems a bit weird, but maybe there's a reason for this, like displaying the user avatar in the center. We'll keep you updated! Note: Unity Greeter has been uploaded and should be available in the Oneiric repositories soon (package name: unity-greeter), however, it has not been set as default yet.